Steaks | Black River - Saddle up. Own the grill. Our great Angus beef taste. From start to finish. We use only Angus beef aged to perfection. Then we hand-trim and marinate our steaks to ensure extra tenderness. But we leave the finishing touch to you: a bottle of our unique Black River Angus Steak Spice comes in every box. Black River AngusTM/MC means great steak taste. Each steak is individually vacuum packed and quick frozen to guarantee freshness. 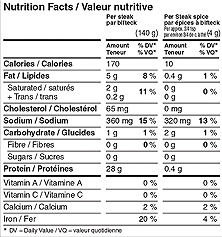 Angus Steak: Beef, water, salt, dextrose, onion, garlic, soy sauce powder, (wheat, soybeans, salt), maltodextrin, modified corn starch, flavour, spices and spice extracts, sodium diacetate, lactose (milk), papain (sulphates), tricalcium phosphate, (MFG AID), polysorbate 80 (MFG AID). Angus Steak Spice: Dehydrated garlic, spices, salt, canola oil, citric acid, dehydrated red bell pepper. For best results, thaw steaks in their package in refrigerator for approximately 4 hours or overnight. Remove steaks from plastic packaging. Season with Angus steak spice before, during or after cooking. Let steak rest for 1-2 minutes before serving. Cook to desired internal temperature. Heat 1 tsp cooking oil in a non-stick fry pan over medium high heat. Cook steak, turning once or twice. Cook on pre-heated electric grill set at medium high. Appliances vary. These are guidelines only.